Dollars for Doers program: our company's way of rewarding those employees who volunteer within the community and input their hours into our volunteer database. Grants, which go directly to, in this case, the Forgotten Soldiers Outreach, varied from $100 (total of 20 volunteer hours) to $250 (total of 40 volunteer hours) for a possible grand total of $350 per volunteer. As a reminder, I posted about O:W&F and Forgotten Soldiers here. 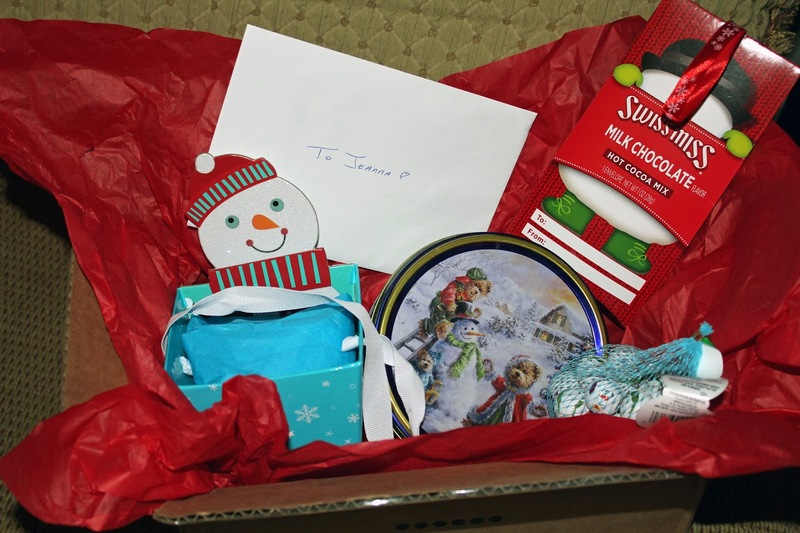 Last Saturday was the FSO Holiday Packing Event and they included our 321 helmet liners in the soldier's boxes. Here is a picture of some of the knitters at the event (I am on the far left and Debbie is second from the right). 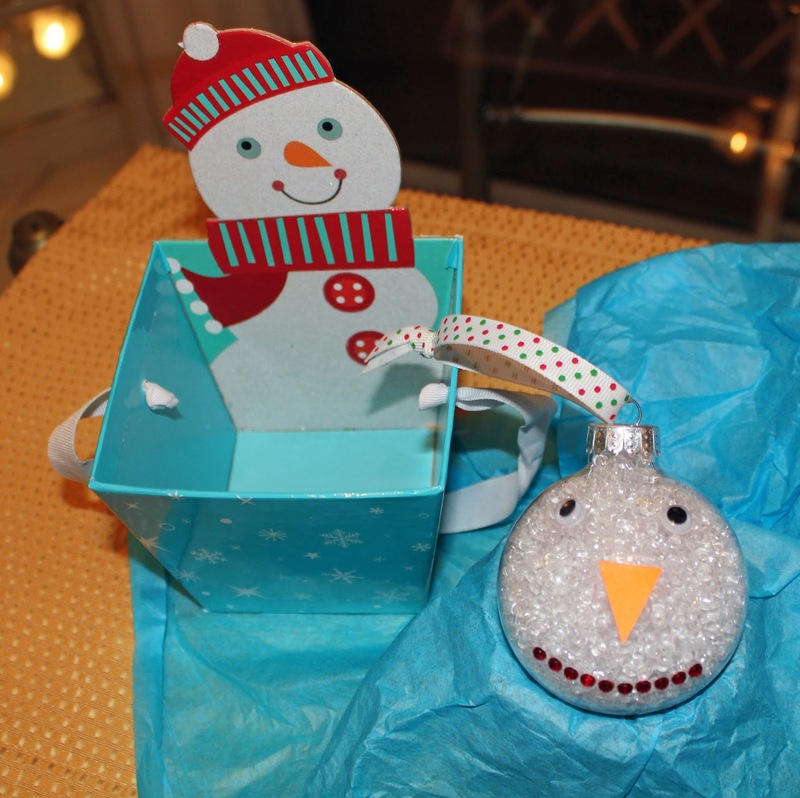 Sweet Vicky from Life On Willie Mae Lane recently hosted an ornament swap. This was my first swap and it was so much fun. Thank you Vicky for hosting! Part of Vicky’s desire was that each person would make two new friends, the person you receive an ornament from and the person you send an ornament to. 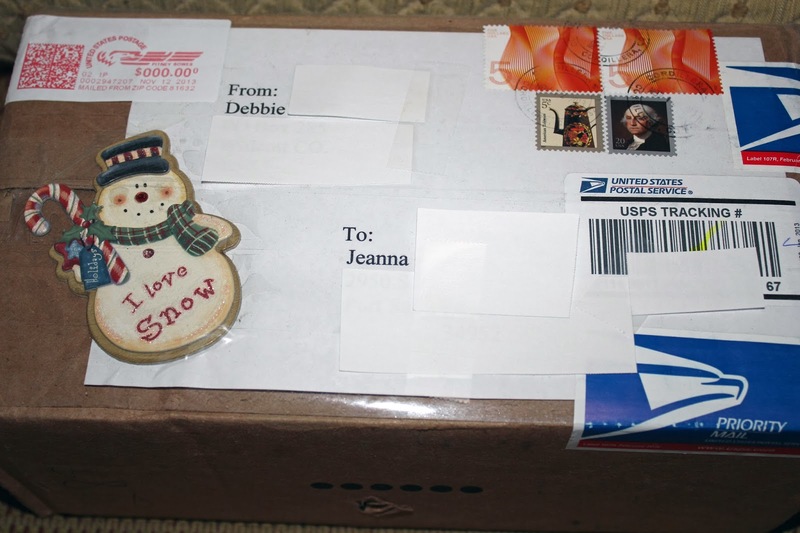 Debbie sent me the sweetest snowman package, because I heart snowmen. She even decorated the outside of the package. 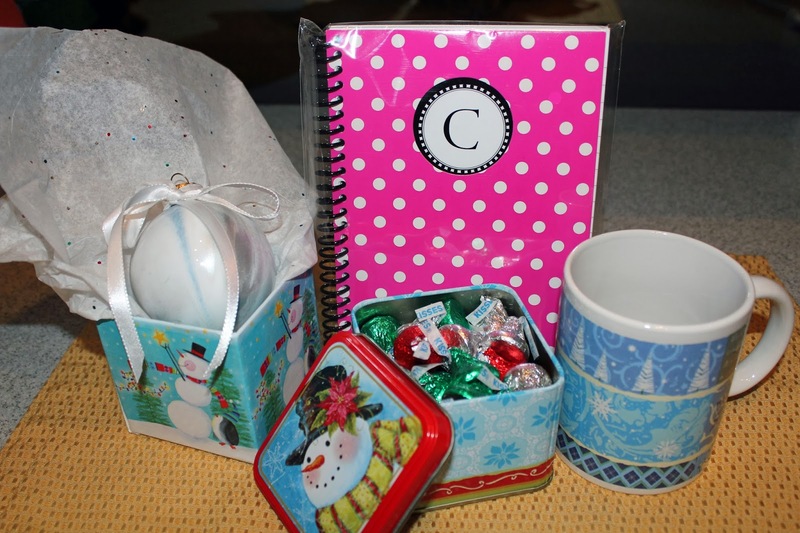 A package of surprises…hot chocolate, Gourmet cookies, milk chocolate snowballs . Debbie doesn’t blog ~ yet ;) ~ so she keeps up with blogland through her daughter's blog The Enchanted Rose. Stephanie is friend number two. You should pop over and read the poem she posted today and check out her amazing photos! Now my third friend is Carol from Art and Sand. She was the recipient of my ornament. 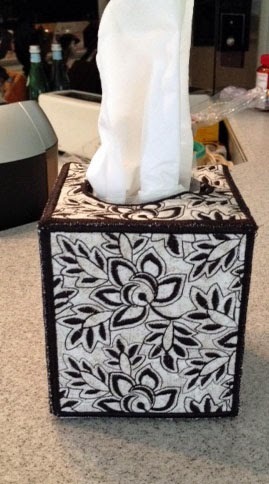 When you visit Carol’s blog you will notice she is an artist…no pressure here J From reading Art and Sand, I learned that she doesn’t decorate using traditional colors. 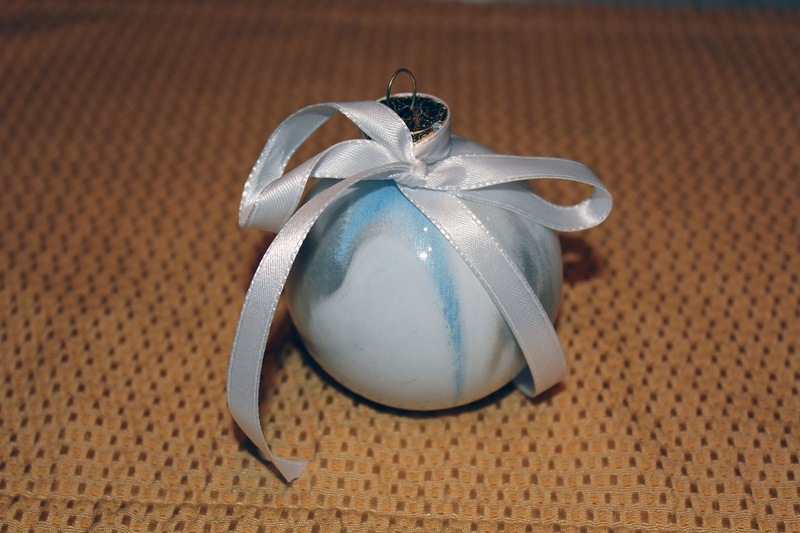 So I gave her this ornament, I painted the inside using blue, white and a little grey…beach colors since Carol lives very close to the ocean... you know, like right down the street. 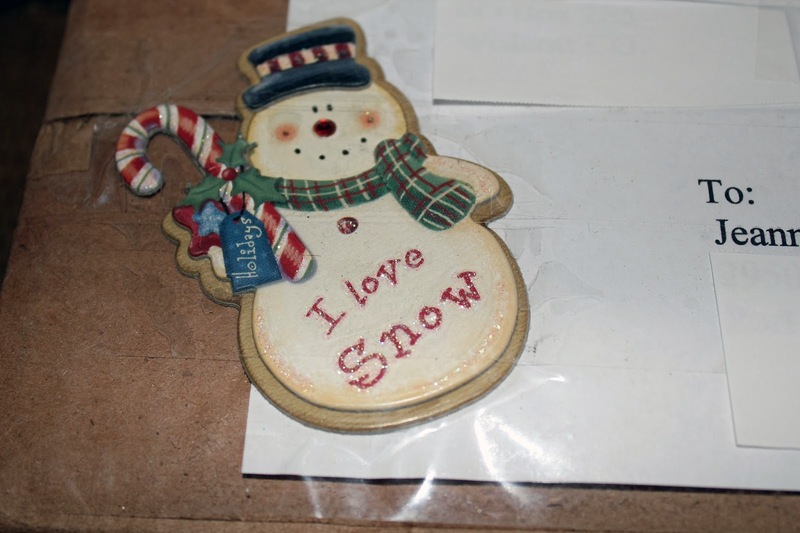 I hope Carol likes her ornament as much as I like the one Debbie gave to me. 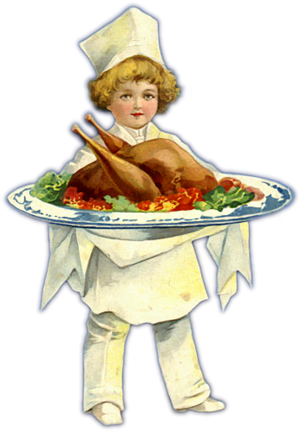 And I hope you have a great week… a short one for those of us celebrating Thanksgiving. I know, I know…with all the UFOs in my sewing room, I have no business starting something new. Well, does it count if I’m not actually starting it now? 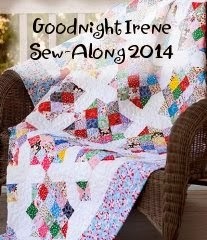 There is a cute little button on my sidebar for Goodnight Irene Sew-Along…click it and it will take you to Terry’s blog. She is hosting a sew-along that begins in January 2014. You can read about it here and here. After you read a few of Terry’s posts you will learn that she is a high-achiever…in a GOOD way! She has a plan for our sew-along and at the end of 7 months…we will have ACHIEVED one amazing quilt. Won’t you join us? If so, please read Terry’s blog and let her know you want to participate. And if you decide not to join the sew-along, please continue to follow her and watch her progress, not just on Goodnight Irene but on all of her amazing quilts. Well, they would be great candidates for Terry’s project BUT, I fell in love with her test quilt in batiks. Sewww…. since my birthday is next week, I’m going to ask for a jelly roll of batiks in blues. YUMMY! I've since zig-zagged over the seams again so the white no longer shows through. My sewing machine has been pretty quiet during the week but that will have to change. Christmas is just around the corner and I have a few items to finish for gifts.